The jury was told that Khan was at the centre of a terrorist "cell"
A man described as a "fanatic" has pleaded guilty to plotting to kidnap and kill a British Muslim soldier. Parviz Khan, 37, an unemployed charity worker from Birmingham, intended to seize and behead the serviceman "like a pig", Leicester Crown Court was told. 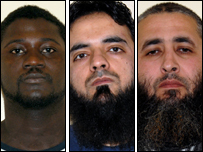 Three other men, Basiru Gassama, 30, Mohammed Irfan, 31, and Hamid Elasmar, 44, have admitted other offences connected with Khan's plot. 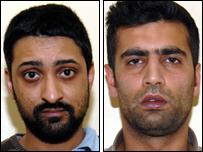 The court heard Amjad Mahmood, 32, and Zahoor Iqbal, 30, denied involvement. The jury was told how Khan, of Alum Rock, intended to use drug dealers to kidnap the soldier while on a night out, behead him in a lock-up garage and then release footage of the killing to the public. Nigel Rumfitt QC, prosecuting Mr Mahmood and Mr Iqbal, who both deny two offences relating to the plot, told the court that Khan had planned to seize the serviceman in Birmingham's Broad Street entertainment district. "He would be taken to a lock-up garage and there he would be murdered by having his head cut off like a pig," he said. "This atrocity would be filmed... and the film released to cause panic and fear within the British armed forces and the wider public." Mr Rumfitt told the jury that Khan had been "a fanatic" at the centre of an Islamist terrorist "cell" based in the Birmingham area. He had gathered computer hard drives, range-finders and night-vision equipment, which was to be sent to terrorists operating near the Afghan border in Pakistan, the court heard. "He is a man who has the most violent and extreme views, " Mr Rumfitt said. "He was enraged by the idea that there were Muslim soldiers in the British army, some of them Muslims from The Gambia in West Africa." The jury was told that Khan had wanted Gassama, a Gambian national, to help identify the victim of the plot. But when Gassama had failed to provide details of a target, the plan "lay dormant" after July 2006, Mr Rumfitt said, only to be revived in November 2006. The jury was told that a bug placed in Khan's home by the security services recorded "highly incriminating and damaging comments". The prosecution alleges Gassama visited Khan on 6 November 2006 and was shown videos of beheadings in a bid to persuade him to assist in Khan's plot. "To his credit, there is no evidence that Gassama ever did help. On the other hand, he failed to report Khan to the authorities," Mr Rumfitt told the court. The prosecution also says Khan had been recorded telling Mr Iqbal about video camera equipment used to make terrorist propaganda films of operations and suicide bombers' wills for broadcast on television channel Al Jazeera. "Mr Iqbal must have known perfectly well what he was getting himself involved in," Mr Rumfitt said. A transcript of an alleged conversation in a Pakistani dialect between Khan and Mr Mahmood was read to the jury by Mr Rumfitt, in which the prosecution says Khan, referring to the kidnap victim, told Mr Mahmood "two lads" would "show blades and get him in the car and take him". After reading the transcript, Mr Rumfitt said: "It's apparent that Mahmood knows what he [Khan] is talking about. "It's that information which Mahmood should have taken straight to the authorities and didn't." Khan, who also admits intending to supply equipment to terrorists on the Pakistan-Afghanistan border, pleaded guilty to the plot earlier this month, but his plea can only now be reported as the trial of Mr Mahmood and Mr Iqbal has begun. Mr Mahmood, of Alum Rock, Birmingham, denies knowing about Khan's plot and failing to disclose information about it, while Mr Iqbal, of Perry Barr, Birmingham, denies possessing a computer disc called Encyclopaedia Jihad, which would be likely to be useful to a terrorist. Both men have also pleaded not guilty to helping Khan supply equipment to terrorists in Pakistan. Irfan and Elasmar have pleaded guilty to helping Khan supply the equipment, while Gassama, of Hodge Hill, Birmingham, has admitted knowing about the plot and not telling anyone about it. The men were arrested in a series of high-profile raids in Birmingham at the end of January last year after an investigation led by West Midlands Police Counter-Terrorism Unit. 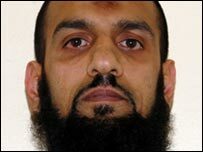 Khan was later charged with plotting to kidnap and kill a member of the British armed forces between 2 April 2006 and 1 February 2007.